Astronomy Science ~ New data from NASA satellites, Mars have shown that when a comet called Siding Spring passing very close to the red planet, tons of comet dust that form the Martian rained thousands of fireball. This event makes the atmosphere of Mars was covered by all kinds of metal and the remains of eerie yellow light on 19 October. 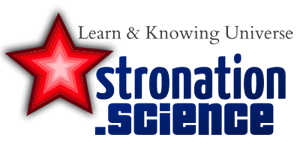 Meteor shower contains magnesium, sodium, iron and other metals, may be categorized as Meteor Storm, said scientist Nick Schneider of the University of Colorado. Magnesium surge to physically change the atmosphere around Mars, while sodium leaving a yellowish light in the sky after the meteor shower is finished, he said. "This event would be wonderful to be seen by the human eye," said Schneider, who is chief scientist at one of the instruments on the Mars orbiter. The best view will be seen from the surface of Mars, where NASA has rovers Opportunity and Curiosity Mars is looking up at the sky. But the rovers could only take an images, said chief planetary scientist Jim Green. No video capture falling stars that make it a spectacular light show. (Up to now there is no bright meteor sightings reported by Rover on the surface). Instead, NASA satellite recorded a lot of scientific data, allowing astronomers to explain what happened. Currently flyby of Mars on October 19, NASA's Mars Atmosphere and Volatile Evolution (MAVEN), NASA's Mars Reconnaissance Orbiter (MRO) and ESA's Mars Express spacecraft detected a very strong ionization in the ionosphere of Mars'. 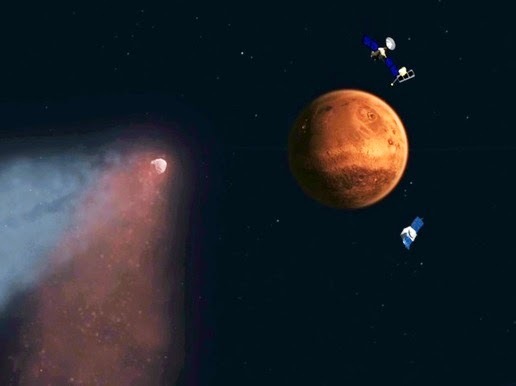 This ionization is caused by comet particles that bombard Mars through the upper atmosphere, producing a layer of charged particles produce (when comet dust enters the Martian atmosphere that produces lesatan meteor). The essence of this comet drove around the planet Mars at more than 125,000 mph (201 200 kph) and its core is likely to have a diameter of about 1.2 miles (2 km). It was not only great, but attacks the dust is far greater than the alleged NASA, said Green. NASA models predict that dust will not be enough to harm satellites in orbit around Mars, but NASA still move all of its satellites to the other side of Mars to avoid the comet's dust and it turns out, it is quite wise. Comets originate from the Oort Cloud, the area at the edge of our solar system. Comets originating from there like this are very rare, the possibility of some 8 million years. And when they came toward the sun they are not dusty like other comets, more pure, astronomers said. (Because the comet from the Oort Cloud this type perihelionnya / its closest approach to the Sun is quite far). "We've never had the opportunity to observe the Oort Cloud comets up close," said Green. "Ga usa tired go the comet, the comet itself which comes to us."